I do think that it gets easier to be brave the more you do it. Practice makes perfect, after all. The more we try new things and put ourselves out into that great big world, the more we are willing to say, oh, what the hell! And throw caution to the wind the next time. As most of you know, I have been on the self-publishing path for a while now. Recently, thanks to my friend, Bee, I am actually writing down the weekly, monthly, yearly goals and making myself accountable for this dream. I have a plan that is a work in progress. The more I research and learn about the various steps in this process, the more that plan is tweaked and the timeline is altered and the to-do list is added to, but I have made more progress in two weeks than it feels like I have made in the last two years. And, yes, I have been nervous and scared of each new step. There is a lot more to self-publishing than hitting a button. There is editing, formatting, cover design, interfacing with the various outlets you plan to sell in, marketing, tax issues to look into, copyright, buying ISBNs and bar codes, understanding public domain and fair use, deciding to form a business or not, and on and on. Each step takes a lot of researching and poking around the internet. It means telling people who I know about my dream of publishing And asking for their help. It means that I am reaching out to strangers and admitting, “Hey, I wrote a book,” and in some cases it means sharing the synopsis or sample chapters. For a writer who has never shown her book to strangers, that is huge. And I have done all of that in the last few weeks and will continue to do it for as long as I want to publish. I have learned that once you start down this path, you will never reach a point where you are not learning something new. Even published authors continue to hone their craft. Self-published authors continue to learn all about the business of getting the book to the public in an industry that is changing fast. I know nothing about formatting… yet… After the month-long class I am taking in April at WANA, I hope to understand it a lot more. I know nothing about editing that I didn’t learn in high school and college. 🙂 After working with one of the freelance editors I have reached out to I hope to know a lot more. I have never designed a cover or worked with a graphic artist, but I am learning that, too. Each new step seems huge and insurmountable, but I am meeting some wonderful strangers who are more than willing to help me in my journey. 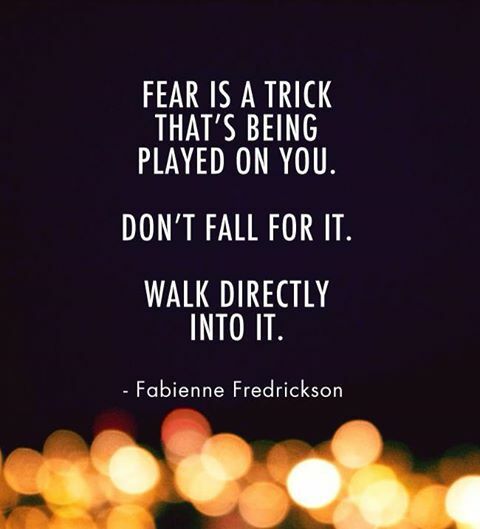 The trick is pushing that fear back far enough to allow myself to take the tiniest step. It is owning my ignorance in such matters and not freaking out too much at the sheer volume of things I have to learn and do before this can happen. It is allowing myself to appear vulnerable and asking for help. Those steps may seem like no big deal to some people. There are folks out there that love the spotlight and seem to thrive on talking about their work in progress at every possible opportunity. But I think everyone has the fear of the unknown within them. It is how they respond to it that determines if that dream will see the light. It is whether they choose to do it anyway that matters. If we let fear of the unknown derail us from pursuing our dreams, we lose. I don’t know about you, but I think she nailed it. 🙂 Fear and uncertainty grab me on a daily basis on this journey, but I am going to do it anyway. The other option is to pay someone at fiverr to format it for you. I’ve used them before – inexpensive and professional. I don’t have any good advice to give you because I am way behind you in this journey. I hope to learn from you – let you clear a path & hopefully be a mentor. I applaud the steps you have already taken. Very true that we’re always learning. In fact, the more we learn, the more things we realize we don’t know. This is true of writing and publishing as well as other areas of life. Can be humbling at times but also very exciting. I wish you continued success along your journey!